We offer an extensive range of services, some of which are included below. If you have questions about any of our treatment options, please give our friendly staff a call to see about scheduling an appointment so we can review your specific treatment options in more detail. Please click on any of the topics listed below to learn more. Fluoride is a natural substance that helps strengthen teeth and prevent decay. 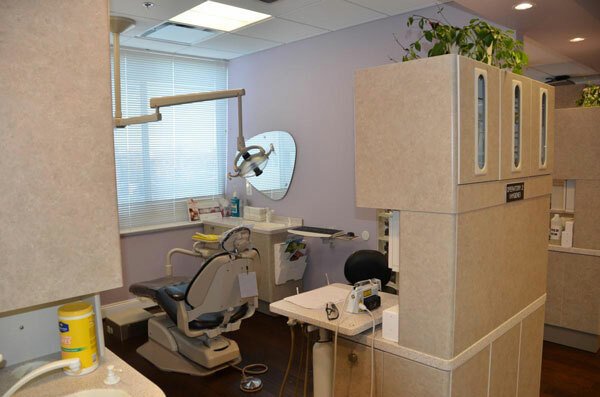 Fluoride treatments are administered at this office as in important component of pediatric dental treatment. The fluoride is applied to the teeth in a gel, foam or varnish form. Oral cancer affects thousands of Americans yearly. Dr. Papageorgiou will complete a thorough clinical exam of all the oral tissue to check for any changes in the tissue consistencies and/or lesions. With early detection, cancer may be caught before it has time to spread, potentially saving lives. A bridge replaces missing teeth without the use of a denture or dental implant. A fabricated tooth is connected to crowns that are placed on the adjacent teeth. The adjacent teeth and bridge structure itself provide the support for the restoration. If multiple consecutive teeth are missing, an implant may be recommended to provide support for a bridge. Lumineers® porcelain veneers are thin pieces of porcelain used to recreate the natural look of teeth. To place a veneer, a very small amount of the original tooth enamel must be removed. Afterwards, an adhesive layer is placed between the slightly prepped tooth and the veneer. The veneer is then hardened with a curing light. An inlay or onlay is a partial crown restoration that can be placed when there is not sufficient tooth structure to support a filling, but not quite large enough to require a crown. They are made of a composite or porcelain that aesthetically and functionally replaces the missing tooth structure. Cosmetic bonding is the process of filling or restoring teeth with a tooth-colored material in order to maintain a natural appearance. In order to bond a tooth, tooth colored material is added to the tooth to build it up. While results vary from person to person, your smile will be noticeably whiter with Philips Zoom! With Philips Zoom! WhiteSpeed, you can get up to eight shades whiter teeth in one 45-minute office visit. Philips Zoom! DayWhite and NiteWhite offer a dramatically whiter smile in one to two weeks. And unlike over-the-counter options, your dentist will work hand in hand with you until you’re completely satisfied with your results. Root canals are most often necessary when decay has reached the nerve of the tooth or the tooth has become infected. When root canal therapy is performed, infected or inflamed pulp is removed from the tooth chamber. The inside of the tooth is then cleaned and disinfected before filling and sealing to limit the possibility of future infection. Soon after the root canal is performed, the tooth is restored with a dental crown or filling to protect the tooth and restore normal tooth function. A custom removable acrylic appliance can be made to intended to protect teeth against wear, breakage and other effects of grinding the teeth (bruxism). Usually worn at night during sleep. Snoring is caused by narrowing or blocking of the airway. The disruption of airflow causes the soft palate and tissues of the throat to vibrate, and the narrower the airway becomes, the louder the snoring.